It is with deep sadness that we announce the very sudden passing of our cherished mother, grandmother and great grandmother on Wednesday, January 10th, 2018 at the St. Joseph’s Health Centre in her 88th year. Predeceased by her beloved husband of 63 years, Edward Sr. Wonderful mother to Gerry (Flo), Cathy (Dale), Dan (Lancy), Chris (Nancy), Patricia (Albert), Joe (Katherine) and Edward (Colleen). Loving grandmother to 16 grandchildren and 17 great grandchildren. Dear sister of Lally (Michael) Foxwell. Maureen will be fondly remembered by her many friends at Weston Golf and Country Club, Victoria Harbour and Florida. 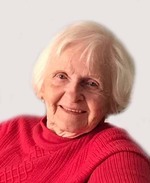 Mom was very passionate about her family times spent at Georgian Bay and Florida and her vast world travels. Friends will be received at the Ward Funeral Home, 2035 Weston Road (North of Lawrence Ave. W.) Weston, on Monday, January 15, 2018 from 2-4 & 7-9 p.m. A Mass of Christian Burial will be held at All Saints Catholic Church, 1415 Royal York Road on Tuesday, January 16 at 10 a.m. Interment will take place in the spring at St. Michael’s Cemetery in Orillia.